Asian festivals and celebrations are some of the most interesting, colourful, odd or plain crazy in the whole world. With so many nations, cultures and ethnic groups, the top festivals in Asian countries can be hard to track down, though. So we asked a specialist and a friend, French photographer Bertrand Linet, who spent the best part of the last 20 years scouring all angles of the continent, from Turkey to Papua New Guinea, photographing some of the best festivals of Asia. 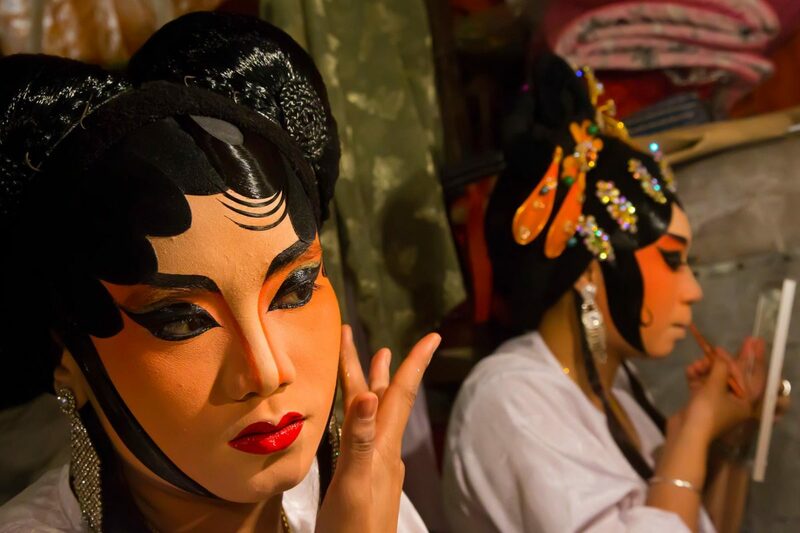 He came up with an ultimate list of festivals in Asia that, we agree, no traveler should miss. Here you have some great inspiration to discover the top festivals in Asia, start planning your next travels, and get more ideas for your Asia travel bucket list. Is touring on folding bikes possible in Indonesia? The following list of famous Asian festivals includes a selection of cultural festivals in Asia that we think you should visit at least once in life. Asian celebrations can indeed be some of the most spectacular in the world: try to time your travels to catch one of these famous festivals in Asia, and you’ll certainly add some great memories to your trip. 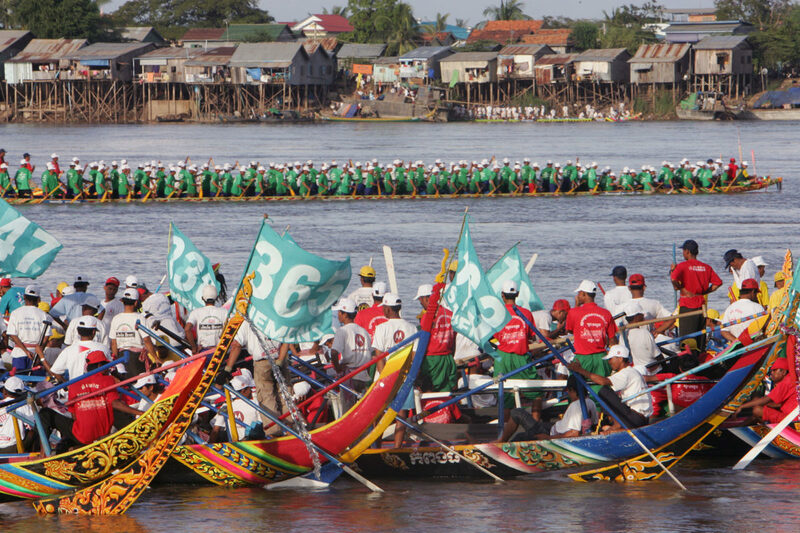 The water festival of Cambodia is a three-day celebration that marks the reversal of the flow between the Mekong and the Tonle Sap rivers. In the rainy season, the Tonle Sap becomes so full of water that it reverses its course, flowing upstream into the namesake Lake. Bon Om Touk celebrates the reversal of the flow to its original direction and the end of the rainy season with boat races and concerts. Every Cambodian town and village participate in this celebration, but the best place to see the races is probably Sisowath Quay in Phnom Penh. In the month of Thai, which usually falls between the end of January and the beginning of February, Hindu devotees parade in the streets of Malaysia, carrying physical burdens (kavadi) to repay the wishes granted to them by Lord Murugan. The kavadi range from the simple hauling of a pot of milk over the head, to the more elaborate mortification of the flesh using hooks and skewers pierced through the skin, tongue and cheeks. 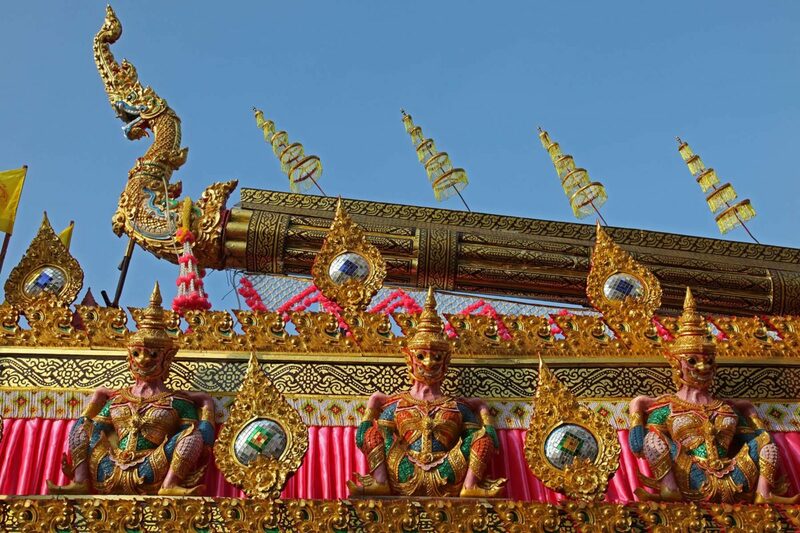 The devotees and their families chant “vel”, which means spear, and indicates the weapon that Murugun used to defeat the evil demon Soorapadman. 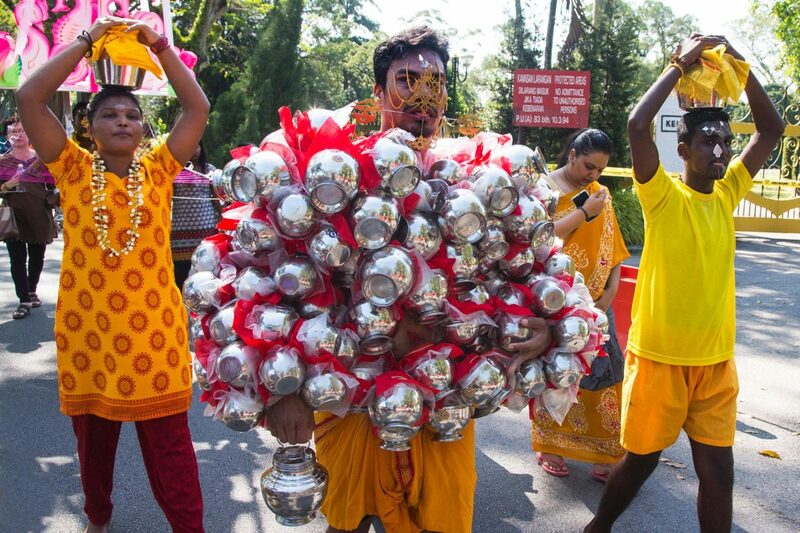 Thaipusam is popular at the Batu Caves in Kuala Lumpur , but it’s more relaxed and engaging in George Town, Penang. Celebrated before the beginning of the rainy season, this festival of the Lao people of Laos and Thailand’s Isaan is an occasion to be happy before the hard work in the fields begins. Today, the bang fai (rockets) are made from bamboo bongs filled with black powder and are exploded with great fanfare together with other firecrackers. During the celebrations, dances, parades, and prayers enliven the streets. 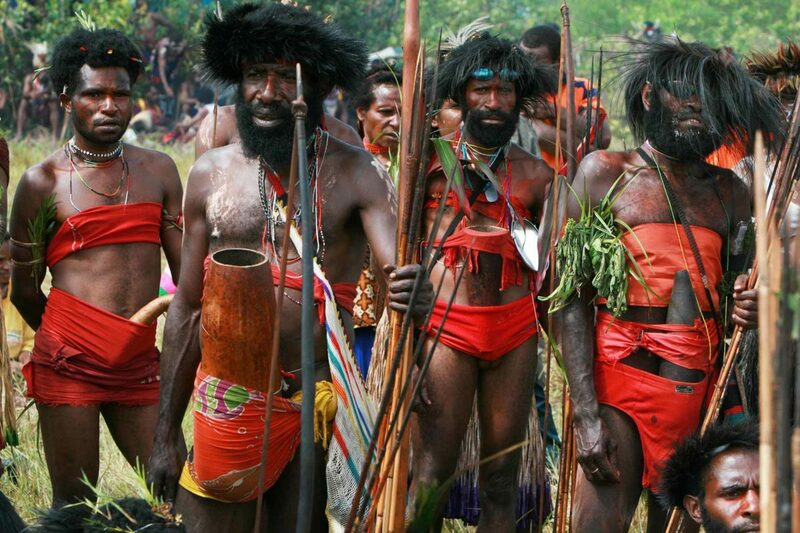 The Baliem Valley festival is an occasion to see traditional West Papuan culture in Indonesia. The tribes of Dani, Lani and Yali descend from the highlands of Wamena and the Baliem Valley to congregate and parade together in full ethnic garb. One of the festival’s highlights is a mock tribal warfare which, for inasmuch as it looks staged, it’s also very interesting to watch and photograph. 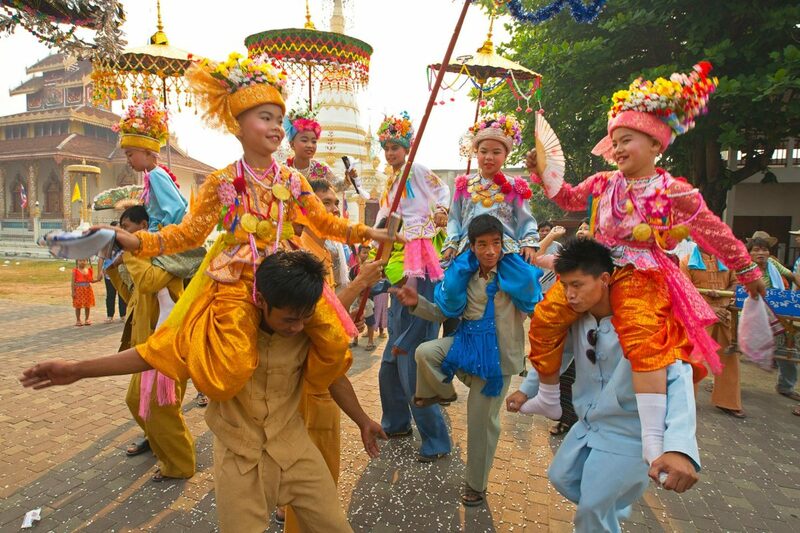 Possibly the best known and more colorful festival in Northeast Thailand, Phi Ta Khon is the name given to a group of celebrations held over three days in the province of Loei. 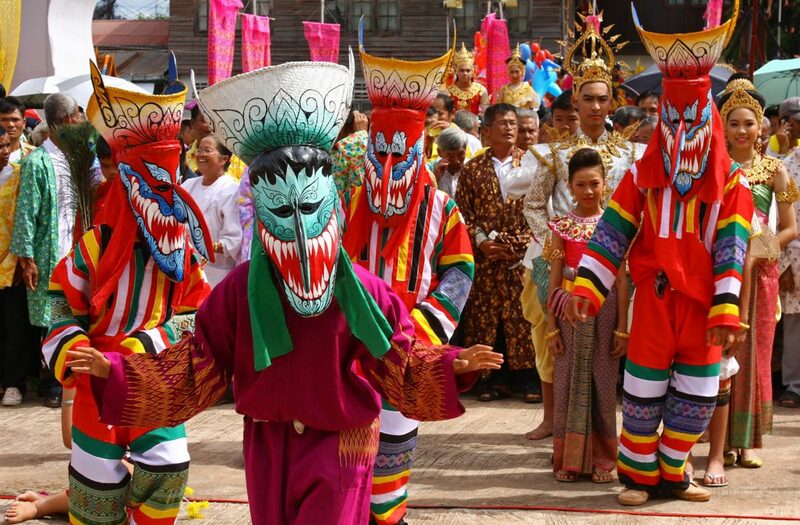 The most striking is the first day, the Ghost Festival itself, when the town residents invite the protection of the river spirit Phra U-Pakut, and then parade wearing the ghosts masks made of husks and coconut leaves. When: The first weekend after the sixth full moon. 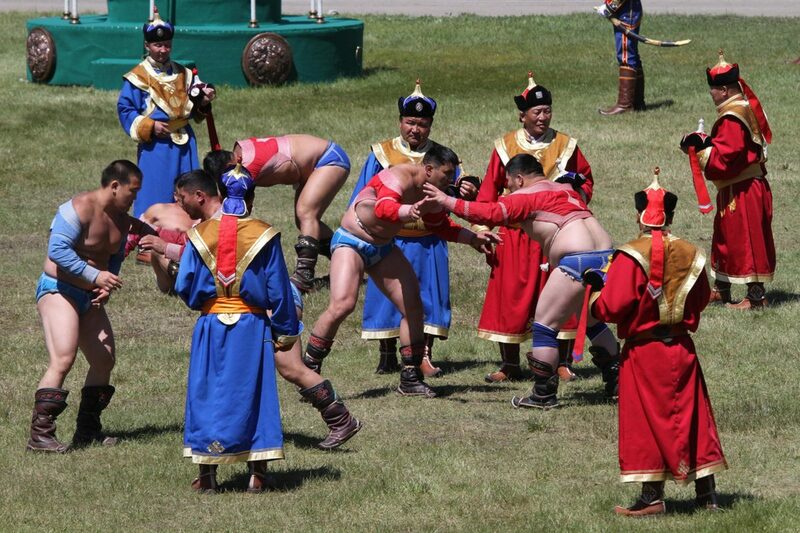 Mongolia’s most important festival celebrates the nation’s nomadic culture with a showcase of Mongolian wrestling, archery, and horse riding. Held in August, when the country is at its most verdant and hospitable, Nadaam is a cultural event not to be missed, and one of Mongolia’s most authentic remaining traditions. Monkhood is considered the utmost honor in Thailand, and the decision of a young man to become a Buddhist monk is received with great pride in their families. During these ceremonies, the young soon-to-be-apprentice monks are celebrated and showered with respect, and their heads often smeared with yellow turmeric powder. When: Ask around, and you will be lucky to find one at a Temple. The quintessential Hindu Balinese purification ceremony takes place several days before the Nyepi holiday, and it’s a symbolic ritual for cleansing the world of all sins and bad karma. Devotees walk on the beach with the aim of cleansing themselves, throwing all the bad things into the ocean, in a solemn and powerful procession. 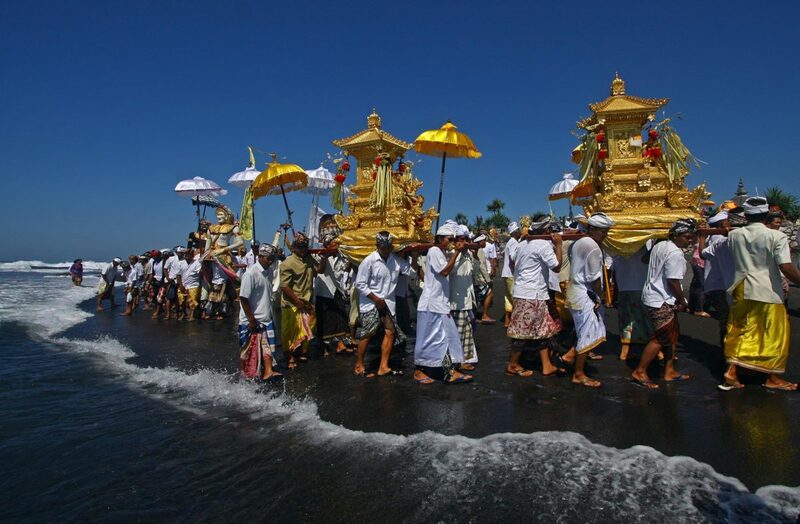 When: Before the Balinese New Year Nyepi, usually in March – April. The small village of Kila Raipur in Punjab, India hosts the Rural Olympics, that celebrate the strength of Punjabi men and women. There are bull, camel, mules, dogs and other animal races, paired with athletic events that include wrestling and rope-pulling contests. 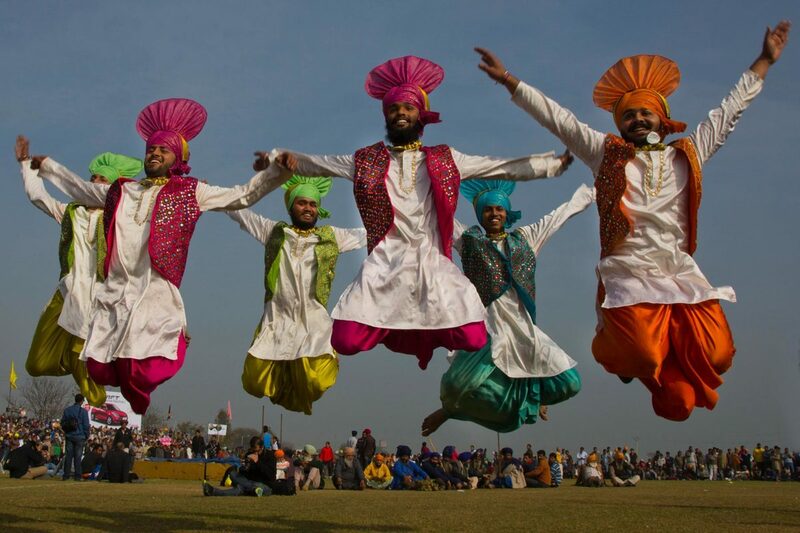 It’s also a chance to see beautiful and colorful Punjabi traditional dresses and dances. Since 2014, bull racing was stopped by Animal Rights groups, but the Kila Raipur Sports Festival still remain one of Punjab’s highlights. Overseas Chinese believe that in the seventh month of the Chinese Lunar Calendar, the Gates of Hell open and all the ghosts come back to Earth, hungry for the material things and entertainment they can’t find in the netherworld. The Chinese community helps them, organizing opera shows, preparing food and, in these modern times, even karaoke singing shows with scantily-clad singers. When it’s time for the dead to go back to Hell, the cardboard statues of their god Tay Su Yah are burnt in ritual street bonfires. By far, this is one of Penang’s most interesting festivals. The Khumb Mela was defined as the world’s largest gathering, with millions of Hindu pilgrims gathering to bathe in one of India’s sacred rivers. There are 4 different festival places (the Indian plains’ cities of Haridwar, Allahabad, Ujjain, and Nashik) where the Mela is held in rotation every 12 years. In Haridwar and Allahabad, there is also a “half” Kumbh Mela held every six years. In any case, you are in for one of the most intense and shocking experiences of your life. This festival was also inscribed by UNESCO as an Intangible Cultural Heritage. When: On rotation in four different holy cities, once every 12 years. 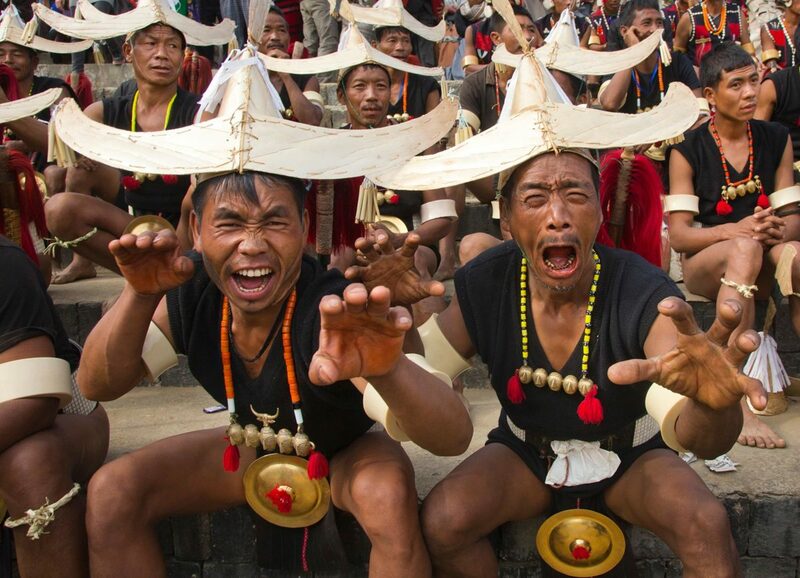 Once a year in December, the Hornbill Festival celebrates all the tribal and cultural traditions of Nagaland, one of Northeast India’s least visited states, rich in ethnic diversity as it borders Myanmar. The dances and cultural events may not look as authentic as visiting real tribal settlement, but in a way, the latter experience is impossible to get these days. A very interesting and colorful event you should not miss if you are interested in South and Southeast Asia tribal culture. 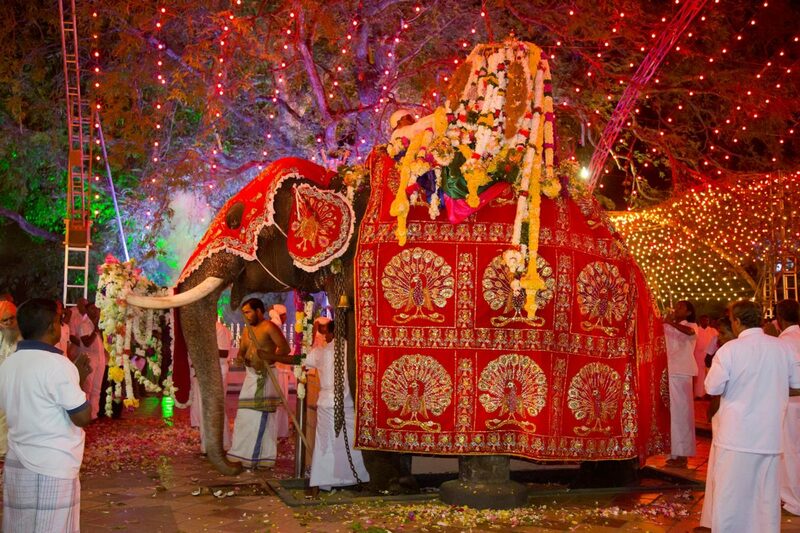 One of the oldest Buddhist festivals in Sri Lanka, Esala Perahera in Kandy is a smorgasbord of dances, juggling, fire-breathers and, of course, lavishly decorated elephant parades. Celebrated in July-August for ten days, it commemorates the time when the Buddha gave his first speech after reaching enlightenment. WANT MORE UNTAMED TRAVEL TIPS TO DISCOVER OFFBEAT ASIA? SUBSCRIBE TO OUR MAILING LIST.